There are so many kinds of medical imaging systems—some are compact, and others are enormous. However, each requires advance preparation before the installation. Here are a few things to keep in mind when preparing to install medical imaging equipment like a PET/CT, MRI, CT scanner, C-Arm or mammography machine. 1) Plan Ahead. There’s a lot of planning required before installation, and it needs to happen before the unit arrives on the steps of your healthcare facility. Arrange a meeting between all involved parties: your facility’s engineering and maintenance personnel, radiologist, sales representative, installation team and even the loading dock supervisor. 2) Name a Team Leader. There needs to be one point of contact at the healthcare facility, that will work with the sales representative, engineering and facilities personnel, electricians, contractors and install team. They should be a great communicator and very organized. The leader should provide all team members with a list of names and contact information. All arrangements should be confirmed and approved through emails and phone calls. If arrangements are made via the phone, a confirmation email should be sent. 3) Know which rooms are affected. The room that houses the equipment may not be the only room that your project will impact. The installation team may have to access surrounding rooms for cables, and electric that might have to interconnect with your system. 4) Prepare the Room. You need to make sure the room is prepared for installation upon delivery. This includes having an RF and Shielding design that is based on measurements taken by the RF and shielding manufacturer (For MRI installation). You need to understand all the HVAC, electrical and mechanical requirements for the room, and have all work completed in plenty of time before the delivery day. These considerations including plumbing, cryogen venting (MRI), fire detection, devices, lighting and even the delivery path of the magnet. Your sales representative will be able to provide you with all the specifications for your equipment, and can work with your engineering team to have everything in place in time for delivery. All parties should have a copy of the approved site specific room plan and ideally, an approved timeline for delivery and installation. 5) Make Arrangements for Delivery. Not only do you need to know when it will be delivered, but you need to make sure your loading area is ready for the delivery. You’ll need to provide the height of the loading dock from the ground, and if it has a lift gate. Which dock should it be delivered to, and where do they move the truck after its been unloaded? How will they move the device and all the boxes to the room? How many hallways and rooms will be affected? Does delivery need to happen after hours? Will the team need access cards? The Team Leader should be involved and available during the installation, as well. 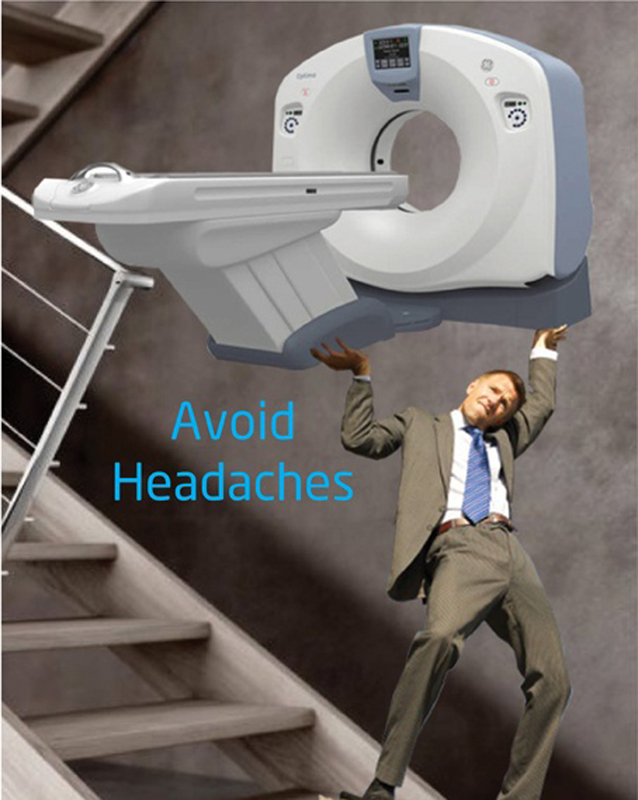 There are lots of moving parts when planning a medical imaging device installation. The key to success is planning, team communications, attention to detail and a Team Leader who is calm, cool and prepared. If you want to reduce headaches due to planning, construction and installation, talk to an expert at Atlantis Worldwide. We’ve helped hundreds of healthcare facilities with installation planning and would love to help you, too. Contact Us Today for your installation needs!